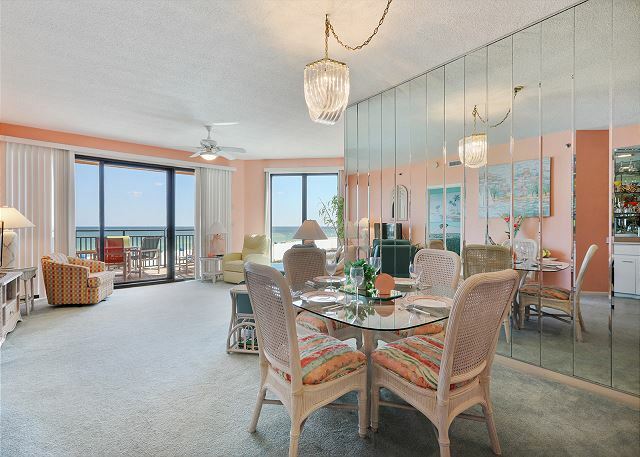 This charming 2-bedroom, 2-bath condo has views of the Gulf and pool area, with balcony access from the master bedroom and the living area. 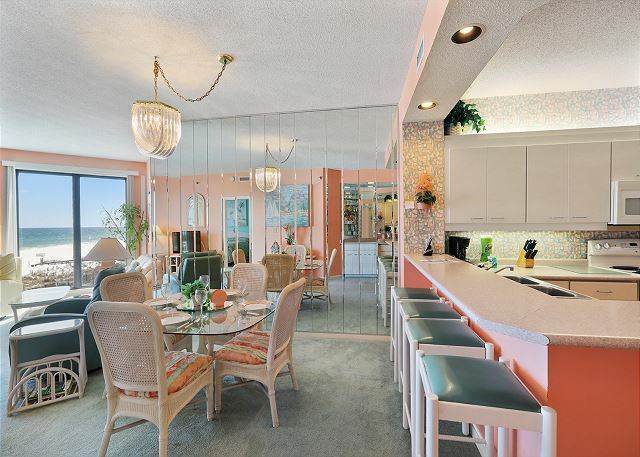 The colorful casual Caribbean decor with carpet throughout and tile in the entry/kitchen area makes this third floor condo especially suited for family enjoyment. 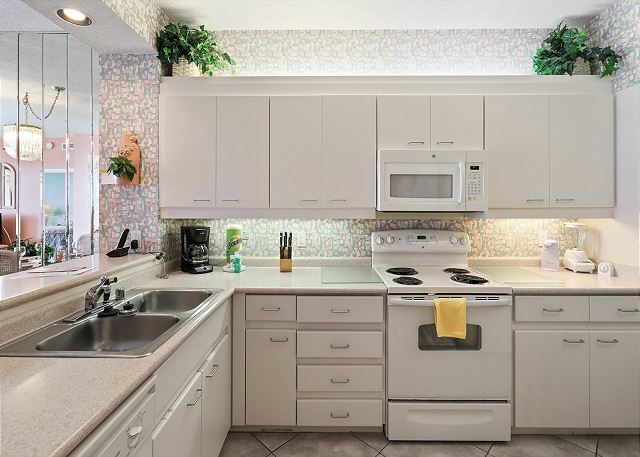 The fully appointed kitchen/dining area includes a wet bar with ice maker, dishwasher, microwave/range, refrigerator, and a separate laundry room with full size washer and dryer. 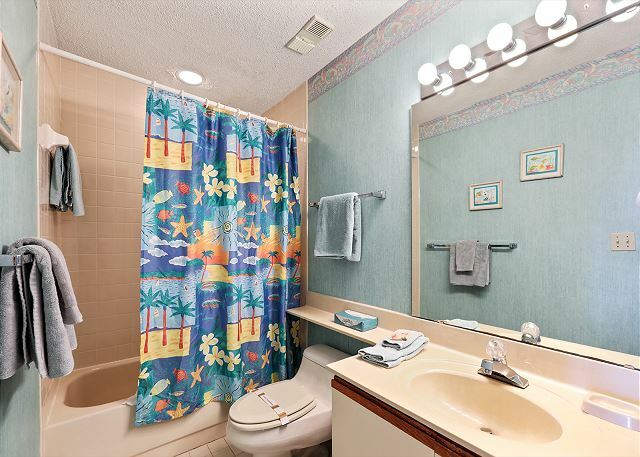 Other features include 9-foot ceilings, ceiling fans, central heating and air conditioning, and a large master bath with whirlpool tub, separate glass enclosed shower, double vanity, and large closet space. Great stay, pleasant office staff, and very nice condo. Weather was great. 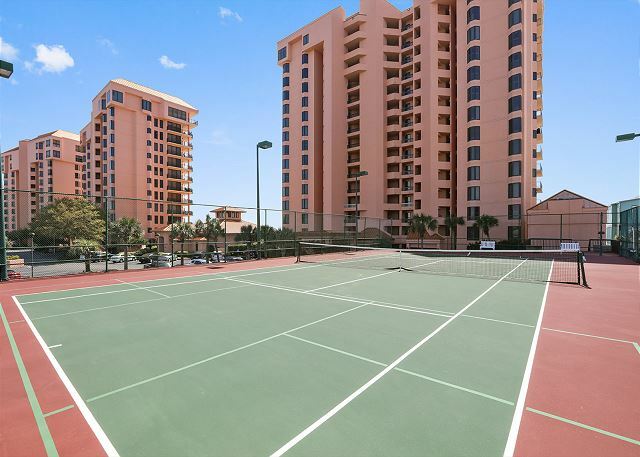 We have stayed in several different condos along the gulf side of Florida from Sarasota to Ft Walton Beach. 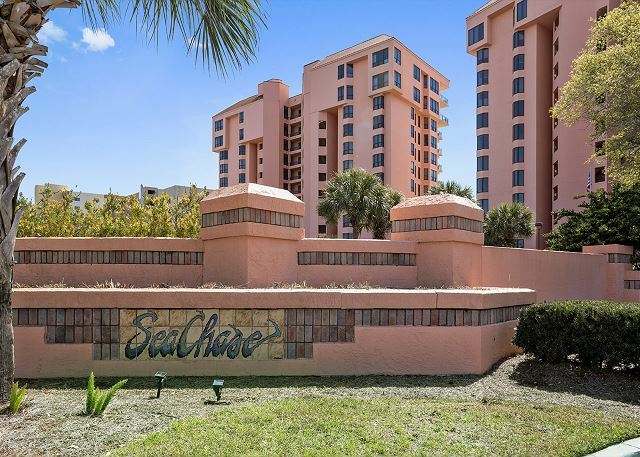 Seachase is by far the best condo we’ve stayed at. The condo was big and the view was amazing. We loved the spacious balcony that gave us a great view of the beach in both directions. The gated community made us feel very safe. The pools were amazing. The lighting at night made a spectacular site. Great location, great facilities, friendly service. We plan on two stays each year from now on - one in the Spring and one in the Fall. Thank you for booking with the Aronov Gulf Coast team. We're so glad you enjoyed your stay at SeaChase and look forward to seeing you again soon! We have been staying at Seachase for several years and highly recommend it. It is convenient to restaurants and grocery stores. We have always had wonderful condos and the staff is great. The pools and grounds are well maintained and the beach has always been clean. Every condo we have stayed in has had well equipped kitchens which is a big plus for cooking that fresh seafood. Fantastic, had a great time. Accommodations were excellent. Usually vacation in Myrtle Beach but after this experience, planning a return trip to Orange Beach. We could not have picked a more appropriate place to meet our needs. We had an elderly person with us who could sit on the balcony and view everyone in our group!!! 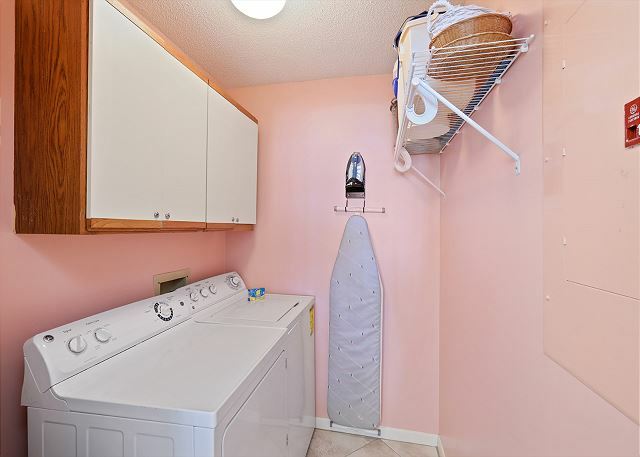 Condo provided more than enough of EVERYTHING!!!! I want this very condo next visit!